Unnat Bharat Ahiyaan (UBA) 2.0 was launched by the Ministry of Human Resources Development (MHRD), Government of India in February 2018. 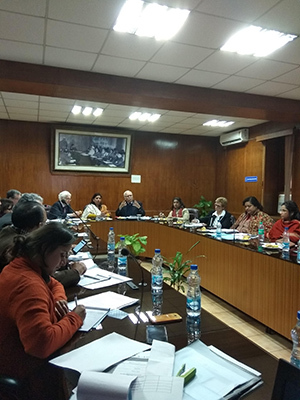 The University Grants Commission (UGC) has set up a Subject Expert Group (SEG) on Curricular Reforms and Educational Institutions Social Responsibility. The SEG has developed a national framework document through a series of consultations. The framework provides an approach to curricular reforms and gives examples from a wide variety of disciplines. 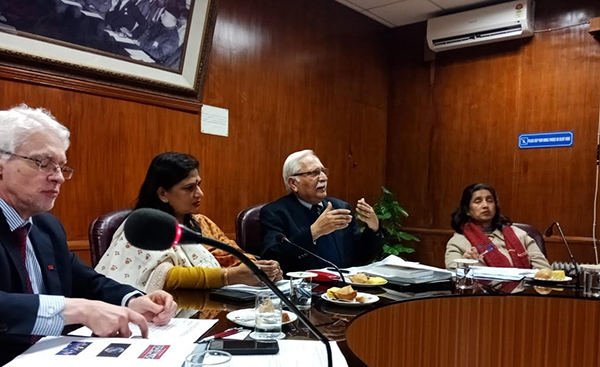 It also includes some best practices on curricular reforms and educational institutional social responsibility, in a way that it can serve as a standard reference guide for Indian universities attempting to enhance their rural engagement to realize the objectives of UBA 2.0. Additionally, the document enumerates a list of recommendations for implementing rural engagement within universities. 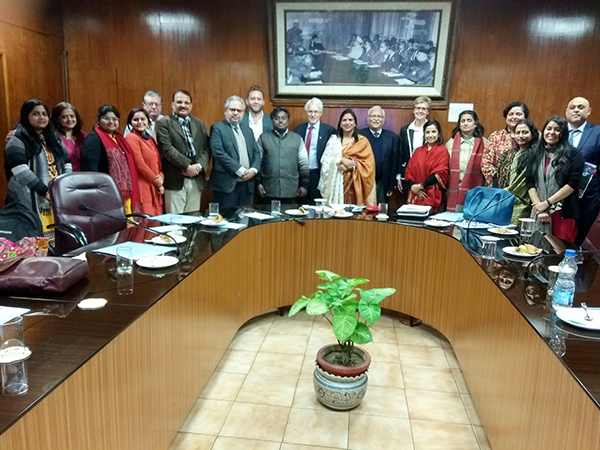 A round table at UGC was convened with social and technical experts from academia, think tanks government departments and Simon Fraser University, Canada. The main objective of the conference was to have wider consultation on different aspects of recommendations enumerated in the national framework document. The dialogue was chaired by Dr Pankaj Mittal; Additional Secretary; UGC. The framework was shared by Dr. Rajesh Tandon; President; PRIA. 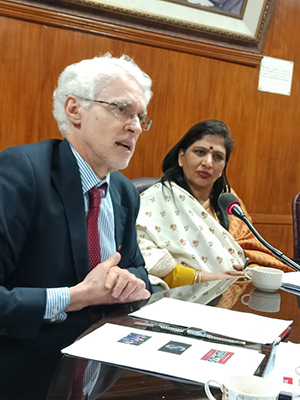 Prof. Andrew Petter, President and Vice Chancellor of Simon Fraser University, Canada shared SFU’s practice of ISR in HEIs from the international perspective. The SEG has proposed two mandates. One is to adapt the existing courses with a perspective on rural community engagement. Second is to offer a standalone orientation course on rural community engagement to be offered as audit or credit course, open for all disciplines. The primary objective is to connect the basic functions of the universities viz. research, teaching and service to the realities of the rural. Once the draft framework has been finalised, it will be submitted to the MHRD which in turn will issue a directive to universities across the country to implement the mandates from the session July 2019 onwards. Some of the critical recommendations articulated in the document include reforming the pedagogies of delivering the existing courses such that there is an improvement in the quality of learning along with the relevance to the community. The rural immersion course is aimed at developing sensitivity and respect for the rural. A standard online course has been proposed to be available in the coming few months. With respect to ISR, one of the primary aims is to make educational spaces non-threatening to students from diverse socio-economic backgrounds. Performing in a socially responsible manner should not be limited to a project but must be integrated in the university thinking and functions. Reflections on practicing Institutional Social Responsibility at SFU opened up some critical areas to think about the recommendations. It was suggested that while basic principle for ISR in HEI may remain common, in application it has to be adapted to the contextual needs and local solutions. A university can do multiple things in its day to day functions which are socially responsible. For instance, as engaged universities it can raise issues of public interest with governing authorities. A semester in dialogue enables students to take up practical issues and work with the community to solve a problem in hand. There are initiatives such as community engaged education and community engaged research where students learn and contribute to local, indigenous and remote communities. Community engagement as service is practiced through centre for dialogue which brings evidence based information from community and university and involves the public in a democratic dialogue. However, apart from University’s social responsibility in education, research, dialogue and service; there are multiple avenues within the HEIs which can be practiced in a socially responsible manner. For instance, the financial wing can deliberately look at investing the funds in terms of procurement and tendering to promote the local employment. The physical infrastructure can be cognizant and take into consideration recycling, reusing and green facilities for financial and environment sustainability. The university has a potential to contribute in socially responsible practices in terms of relationality and resources by enabling ideas that are useful for societies. While the ideas in the circulated framework look promising, attention is required on the implementation of the same. There is a need to identify certain levers for change such as institutionalising specific courses and practices. The challenges of student diversity poses application crisis when it comes to integrating community work or experiential learning component with the curriculum. Clustering of students both socially and pedagogically may be a way forward to address this challenge. Hence, all strategic plans in the university need to reflect this value. While a lot of these transformative practices within universities still depend on individual faculties, it also limits the change as they get transferred or promoted. In order to bring practitioners as a part of the curriculum, deep community engagement needs to become a norm and not as a part of the project. Apart from that, a number of structural issues such as API score needs to be looked at which must evaluate how one looks at the community and the community work. This would need structural reforms on one hand, and institutionalising changes on the other. There is a need to develop meaningful, measurable indicators for impact assessment of these changes and reforms such that these practices are embedded in the overall functions of the University for effecting sustainable change. One also needs to be careful, whether through sensiting students on community service through rural development schemes and programmes, would universities end up being implementers of the government programme. Based on the feedback, the UBA document needs revision. The emphasis needs to be given to change the thinking of the university which should be reflected in teaching, research and service functions.